The city of Ames' traffic staff performs retroreflectivity testing. Clearly marked signs help new students at Iowa State University navigate the streets and highways in Ames. Appropriate signage minimizes accidents and provides clear directions to students, residents, and out-of-town visitors, including people who attend the university football games and other sporting events. The city signage also must conform to state and federal standards regarding signs as outlined in the Federal Highway Administration (FHWA) Manual on Uniform Traffic Control Devices (MUTCD). 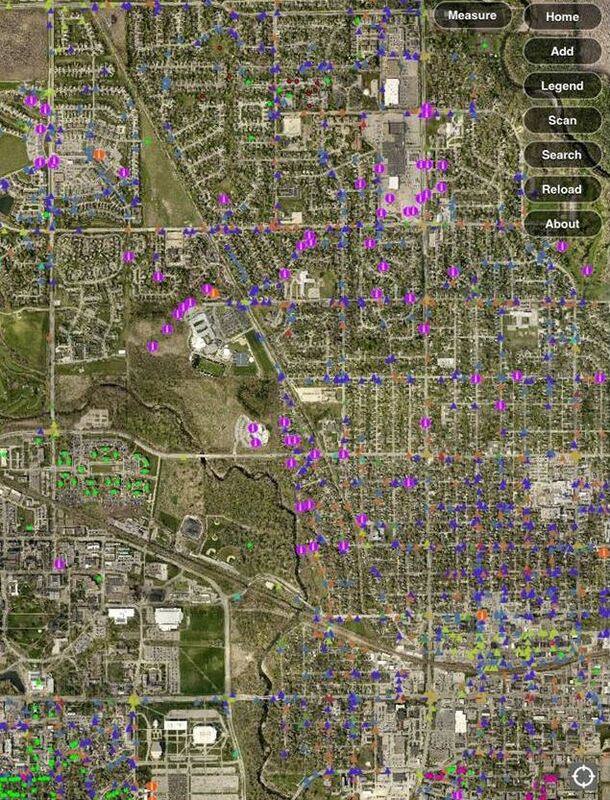 To better manage more than 9,500 local traffic signs, the City of Ames's public works department uses a new, custom GIS-based sign management app called GISAssets. Ames partnered with DGTex, Inc. to create the app, which was built on Esri's ArcGIS Runtime SDK for iOS and runs on the Apple iPad. The GISAssets app is available from the Apple App Store. It's used to collect data, such as traffic sign inventories and asset information, from the field and integrate the information and other remotely collected data with the department's geodatabase. The geodatabase is managed by Esri's ArcGIS for Server. You can use GISAssets to harness the full power of the geodatabase, including domains and complex relationship classes. Ben McConville, GIS manager in the city's public works department, has been using Esri ArcGIS for asset management for many years. "Street signs are a challenge to accurately manage," says McConville. "You would think it is a fairly straightforward procedure; however, there are normally multiple assets at the same location." He says that for each signpost, there may be three or four signs attached. "So at that location, your database will include maintenance histories, accident reports, and retroreflectivity records for each sign as well as the post," McConville says. "In addition, there are replacement and maintenance schedules and vegetation-management procedures related to the assets at that same location." Dominic Roberge, GIS specialist for the city, worked hand in hand with traffic maintenance staff and developers at DGTex to design the application and database schema. "I spent a great deal of time identifying the needs of the crews and exactly what gaps the application needed to fill," says Roberge. "Among them were the need for bar coding and the ability to handle complex relationships. I then designed the database schema to accommodate these needs and published the web services accordingly." 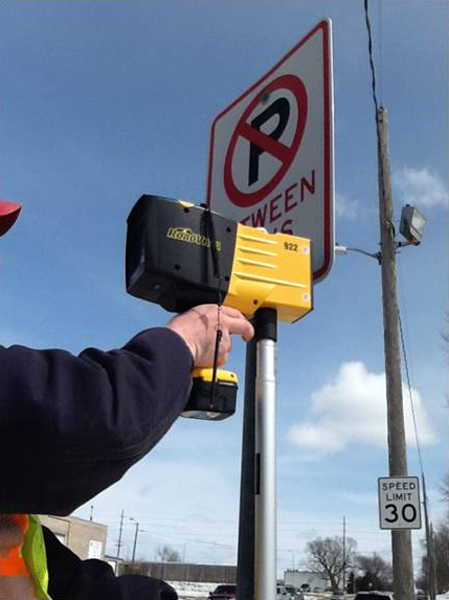 The city uses a RoadVista model 922 retroreflectometer to measure the reflectivity of each of its signs, which is required for the federally mandated retroreflectivity survey. In addition to measuring reflectivity, the device records a sign's GPS coordinates and reads the bar-coded label attached to it for identification purposes. You can use GISAssets to access attachments and multiple levels of related features through its user-friendly interface. "Signs are frequently knocked down by vehicle accidents, vandalism, or snowplows," says Bill Latham, an Ames traffic maintenance worker. "Often the signs are simply dropped at the maintenance shop by law enforcement or maintenance crews, with no explanation of where they may have come from. By using bar coding, staff can easily see exactly which sign it is and where it came from, making it easy to reset." Back in the office, the data recorded by the retroreflectometer is downloaded to the GISAssets app, which uses the sign's bar code for reference. The application then performs a join to the department's geodatabase, and the field data is automatically added to it, which helps centralize all remotely collected data with the geodatabase. Because each sign's reflectivity data and history are now part of the database, the city's traffic department can easily check to see if a specific sign is in compliance with the MUTCD. 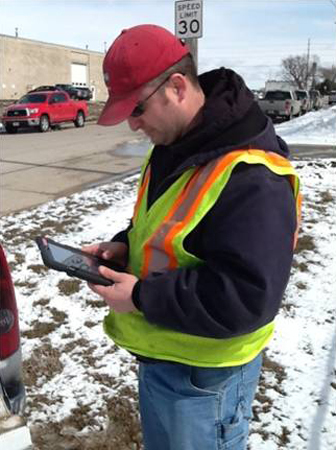 Public works staff can perform this verification process either from the office or in the field with their iPads, which saves both time and money. "During city construction activities, GISAssets has proved to be extremely helpful," says Terry J. Keigley, an Ames traffic maintenance worker. "Contractors often remove entire blocks of signs prior to construction. Sign crews are now able to easily reset the signs in the exact location with no measuring. The GPS typically gets us close enough to where we can find the existing hole or stem to place the sign on." 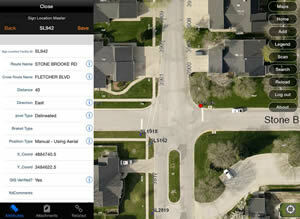 Ames traffic staff efficiently collect and access live information in the field using GISAssets on an iPad. Before using this app, the Ames public works department was faced with bulk replacement of its signs in a specified area every five years to comply with FHWA mandates. Field crews can now evaluate these assets, sign by sign, and then send this information to the geodatabase back in the office, where it is determined whether a sign should be repaired or replaced and subsequent work orders issued. The iPad provides other functionality that is improving the department's workflow. This includes messaging between workers; sending broadcast e-mails; and shooting a photograph or video of an emergency situation in progress, such as a water main break, and sending the photo or video to the engineering department for evaluation. This information can also be attached to the geodatabase. "The ability to easily attach pictures is a huge benefit," says Brad Becker, traffic signal lead technician. "Pictures are a great tool to help us see what information may not be in the attributes. For example, not every MUTCD code indicates what the exact wording is on the sign. By looking at the picture, we can easily see." "Centralizing all our public works as set data has really been a big benefit to us," says McConville. "Previously, there was a lack of integration and field connectivity, which made work tracking and inventorying difficult." The app's intuitive user interface provides access to critical information. 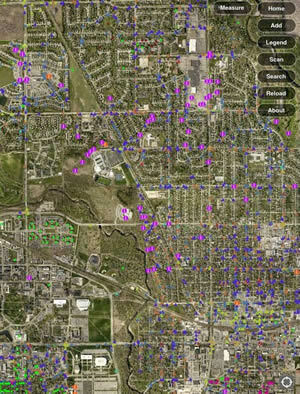 The GISAssets app has sparked interest from other departments and is increasing the use of ArcGIS in Ames, especially since the city has an Esri enterprise license agreement (ELA). "The ELA has opened up a ton of doors for us," says McConville. "It's given us the opportunity to really explore what we can do with GIS." 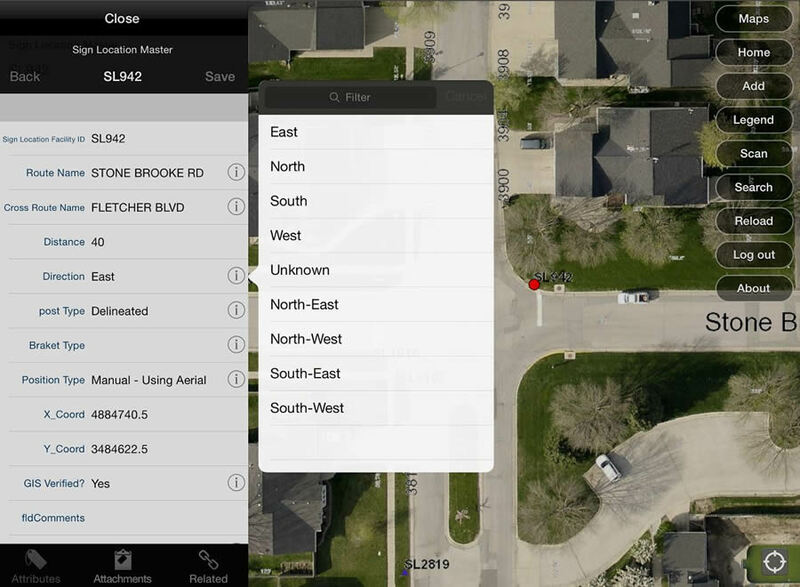 The Ames public works department is expanding its use of the GISAssets app by making greater use of its bar-code reading capability. "Adding bar coding to all our public works assets makes it much easier for crews to immediately identify an asset in the field, determine its condition, and then send that information back to the geodatabase for further review," says McConville. "It will really help streamline our field crews' work and continue to keep our geodatabase up to date." 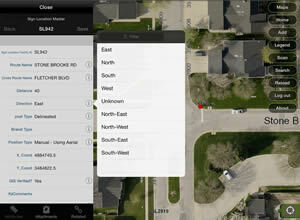 To learn more about the GISAssets app, call Ben McConville, City of Ames, at 515-239-5162, or e-mail him.